I don't know what it is with me about Southern cooking this month. Early in May it was spoon bread, last week it was South Carolina Gold BBQ Sauce, now biscuits. Oh, well-- go with the flow! Actually, I've been on a quest for what I consider the perfect biscuit for years, off and on. When my kids were small I favored the Tassajara Flakey Biscuit recipe (half whole wheat), but it was very rich and contained eggs, strangely enough. I also made a quick drop biscuit called "Pull-Apart Biscuits" (enriched with wheat germ). My mother never made biscuits, that I can recall, so I was on my own. Over the years I've eaten and made many good ones, but some mysterious element was was always missing and the quest went on. 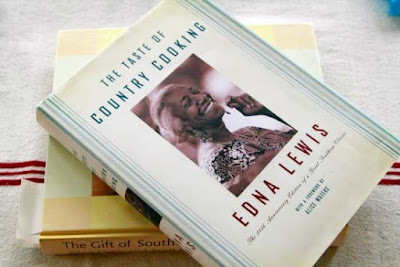 In the last two weeks or so, I got the bug again, and I decided to concentrate on Southern recipes, since biscuits are so integral to Southern cooking. Southern biscuits are pretty much always buttermilk biscuits, even if the title of the recipe doesn't say so. (If they don't contain buttermilk, they are called "Sweet Milk Biscuits"). So, after trying a few recipes (veganized) and being disappointed at the results, I decided to be mildly "scientific" about it and made chart noting the amounts of all the ingredients for the same size recipe from various sources. But first of all, why was I disappointed? The first and most important was that I could taste baking powder in most of them, and you shouldn't be able to taste the baking powder. It should do it's work and the taste should disappear in the process. I believe that many cooks think the more baking powder, the higher the rise. But that's only true up to a point! I did some research on this way back in 1980-81 when I was associate editor for La Leche League International's official cookbook "Whole Foods for the Whole Family" (in pre-vegan days). (The book was re-issued in 1993, but I didn't have anything to do with that and have actually not seen a copy of it.) I concluded that the correct ratio was 1 teaspoon baking powder OR 1/2 teaspoon baking soda per cup of flour (of course if you use baking soda, you have to use an acidic ingredient to get it to work). Another thing that disappointed me was too much fat. Most recipes called for 1/2 cup of fat for 2 1/2 cups flour, though a few were a bit less than that. Next on the list was that I grew tired of the white, white flour! Yes, it seemed necessary for a light, layered texture, and I hadn't had all that much success with whole wheat flour biscuits, but I was determined to reach some sort of compromise. And then there was some unnecessary "fiddling" with some of the recipes-- the worst was the Fine Cooking recipe (and, don't get me wrong! I really like that magazine! ), which contained (for 5 cups flour) 1 1/4 cups butter, 5 tablespoons (!) of baking powder, and required that your butter be frozen, and that your bowl and implements (including rolling pin and food processor bowl) be frozen for a certain amount of time. I thought the whole point of biscuits (a "quick bread", after all) was you could make them quickly and easily on the spur of the moment, but apparently not. My chart of biscuit recipe ingredients (including recipes from 3 editions of "Joy of Cooking"-- 1946, 1973 and 1997, and one from the New York Times) showed me that the recipes using the least baking powder and soda were from actual Southern cooks, Bill Neal (author of "Biscuits, Spoonbread, and Sweet Potato Pie" (1990 and 2003) and Edna Lewis. They both also called specifically for a low-gluten (about 9%) flour (White Lily is the favored Southern brand), and higher cooking temperature than the rest. So, as a template, I decided to use the renowned and respected late Southern chef/author Edna Lewis' recipe, which appeared in the book "The Gift of Southern Cooking" by Ms. Lewis and Scott Peacock. Here's the original recipe online. I warn you-- she used lard. But, she used the smallest amount of fat of any recipe I had seen, and, I figured, she's been doing this for more years than I've been alive, so that amount must work well! Here is the bran, close-up. Thank you Edna Lewis and your expertise! This will now be my go-to biscuit recipe! In a medium bowl mix together the sifted whole wheat pastry flour, the Homemade Baking Powder, and salt with a whisk. Cut the vegan butter into 1/2-inch chunks (approximately).Add the frozen vegan butter chunks and work with your fingers until about half of the vegan butter is finely blended with the flour and the other half is in pea-sized pieces. In a cup, mix together the non-dairy milk and lemon juice. 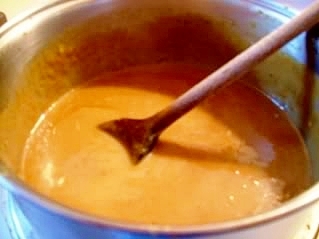 The mixture should curdle immediately. Pour into the flour/vegan butter mixture and stir quickly just until it all comes together. Turn the dough out onto a lightly floured surface—a silicone baking mat is good, or even a piece of baking parchment. Pat the dough out into a rectangle about 1/2-inch thick. fold the ends over towards the middle, pat out again and fold again. Repeat once more. Pat it out once more, evenly this time) to about 3/4-inch thick. Cut biscuits close together with a 2 to 2 1/4-inch round biscuit cutter, without twisting the cutter in the dough. Place them just barely touching on a baking sheet (I use a dark one for more crust on the bottom; you can line it with baking parchment if you like). I don’t exactly re-roll the scraps. I kind of push the edges of them together so that they sort of fit together like a puzzle. Then I fold the mass over itself once and pat or roll gently to 3/4-inch thick and get a couple more biscuits out of it, but they always look a bit raggedy! Other people just bake the scraps (sometimes brushed with melted vegan butter and sprinkled with cinnamon sugar) around the edge of the pan for the kids (or the cook!) to munch on. You can see that the 2 on the Left in front were the ones made with the pushed-together scraps! Bake for 10 to 12 minutes. Check partway through and turn the pan around if they aren’t baking evenly. They should be golden. Brush the tops with the melted vegan butter. Serve hot with your favorite accompaniments—jam, marmalade, agave nectar, vegan butter, citrus curd—and don’t forget that gravy is also a possibility! NOTE: If you keep some until later in the day or the next day (I wouldn't recommend any more than that; and keep them in a paper bag, not plastic) heat them quickly in a 400 ºF oven to crisp them up—do not microwave! Nutrition (per one 2-inch biscuit): 198.6 calories; 28% calories from fat; 6.5g total fat; 0.0mg cholesterol; 296.5mg sodium. This is a very common recipe online. Some people add a bit of cornstarch or arrowroot, but I didn't bother. I'm re-posting this after pulling it because I thought it might be in my book World Vegan Feast, but it didn't make the cut. With barbecue and grilling season ahead, I thought it deserved a second reading, so to speak. I hadn't heard of this sauce until I read a mystery novel by Kathy Reichs (I'm a longtime, avid mystery fiction fan), whose main character resides and works both in South Carolina and Montreal. In one book, her heroine, Temperance Brennan, brings the precious golden mustard-based BBQ sauce from South Carolina to Montreal with her. That intrigued me and the search was on. I found many recipes online-- all different. This is the one I worked out for myself. I have nothing to compare it with (no one's ever heard of it in my neck of the woods! ), but everyone who tastes it goes crazy over it! BTW, despite the fact that the main actress is a vegan, I really don't like the show "Bones", which is extremely loosely based on Ms. Reichs' novels. Read the novels-- they are far superior! 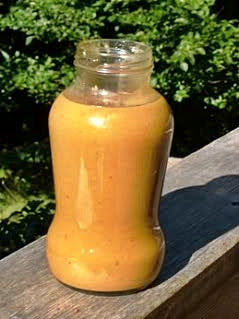 And give this BBQ sauce a try-- it's one of the best I've ever made, takes very little effort to make, and it's so different from most BBQ sauces that it really makes an impression. 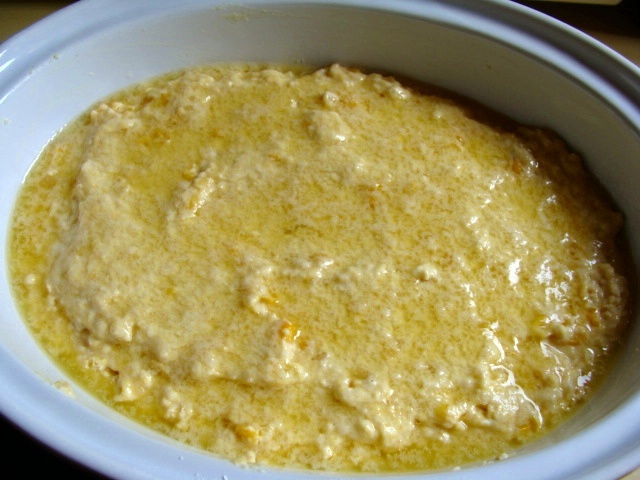 I'm fairly certain that most cooks in South Carolina don't use Dijon mustard, but, what the heck-- it's our favorite and it works! Heat the sesame oil in a small skillet and sauté the onions, stirring frequently, over medium heat until softened. Combine all the other ingredients except the bay leaf in a medium saucepan with a whisk. Stir n the onions and add the bay leaf. Bring to boil. Turn down and simmer for 5-10 minutes, stirring occasionally. Remove the bay leaf. Pour into a jar, cover and refrigerate. Nutrition (per 1/4-cup serving): 108.3 calories; 20% calories from fat; 2.6g total fat; 0.1mg cholesterol; 481.6mg sodium; 146.8mg potassium; 21.3g carbohydrates; 1.0g fiber; 16.3g sugar; 20.2g net carbs; 1.6g protein; 2.2 points. This is going to be a very brief post because I'm cleaning house and making food for some visitors. But I've been wanting to post this stew for a couple of weeks, but I got sidetracked with rhubarb and spoonbread. My sister's DNA ancestry test confirmed that there is some Basque on the Spanish side of my father's family, which gives me a special interest in that particular cuisine. I've only scratched the surface so far, but have discovered that bean stews, or one-dish bean-pots, are very popular in Basque cooking. They usually contain meat, but that's easily remedied with vegan sausages, seitan, tempeh, etc., as well as full-flavored vegan broths. I look forward to trying other variations on the theme. We had a guest when I made this, and she was very enthusiastic in her praise! Spicy comfort food! Very simple (quick and easy to make), but, oh, so good! Serve with crusty bread to sop up the remaining liquid, or with cornbread, which complements it well. You might also like to enjoy a glass of red wine with this dish. Mix the softened onions and peppers in the heavy pot ith the beans, broth, sausage pieces, a few shakes of liquid smoke, and the smoked paprika. Bring to a boil, turn the heat down and simmer, covered, for about 15 minutes or until the stew has thickened a bit. Serve with crusty bread, rice or cornbread. Nutrition (per serving): 482.6 calories; 27% calories from fat; 14.7g total fat; 0.0mg cholesterol; 784.1mg sodium; 817.2mg potassium; 53.3g carbohydrates; 20.9g fiber; 4.7g sugar; 32.4g net carbs; 36.8g protein; 10.1 points. For some reason, I've been obsessed with spoonbread this last week or so. No, I didn't grow up in the American South (though some of maternal ancestors were from Arkansas, Kentucky, Maryland, North Carolina, and Virginia). But I do love corn in any form and making a good vegan spoonbread has been a goal of mine for quite a few years. Today I'm offering you two versions. Neither of them is the old-fashioned soufflé type (I haven't mastered a vegan version of that yet!). The old-fashioned spoonbread is made from cooked cornmeal mush, either yellow or white, eggs (often with the whites beaten separately), butter and milk (or cream). 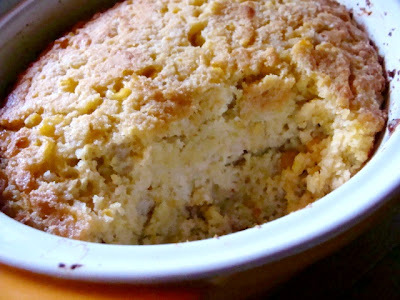 No wonder John Edgerton, author of Southern Food, wrote that it is "the lightest, richest, and most delicious of all cornmeal dishes, a veritable cornbread soufflé." The spoonbread varieties made with un-separated eggs are heavier, more of an "everyday" spoonbread, I suppose. These are the types that are best suited to being made vegan, but I have plans to tackle the soufflé version soon! I tried a couple of vegan versions made with cooked mush, but, so far, they have been on the heavy side, so I'm going to have to do more work on that. For the moment, I decided to try a more modern version, and to re-visit a type of cornbread that I made for years, that I didn't know was also often referred to as a type of spoonbread. I was aiming for a reasonably light, very moist product (but not gooey) that could be scooped out of the pan. Unfortunately, the modern versions contain less corn than the original spoonbread, but I'm going to see if I can remedy that in future. My first recipe is a moist, sumptuous "casserole bread" that utilizes a biscuit mix and canned cream-style corn (which actually IS vegan). It is definitely a modern version of this bread type, but a popular one, judging by the avalanche of related recipes that I found online! I make my own biscuit mix (recipe provided below) and my vegan recipe avoids not only the eggs, but the sour cream, excessive butter or margarine, cheese, and heavy cream that is called for in many similar recipes. The second recipe is actually a cornbread that I made for years and never thought of as a spoonbread-- it's a cornbread that's made in such a way that it ends up with a creamy layer of "custard" on the bottom. It's made in the same way as a pudding cake, with liquid poured over the batter at the last minute before baking. But, in my research, I started to see this type of cornbread referred to as a spoonbread, so I decided to veganize that recipe, too. It's so comforting! I happen to own 3 versions of Joy of Cooking, so I looked up this recipe in all of them to see if it had changed much over the years-- and, indeed, it has, as the ratio of cornmeal to flour has gradually changed. In my 1946 version, the recipe contained 6 tablespoons of cornmeal and 2 tablespoons of bread flour. In my 1973 version, the recipe contained 1/2 cup cornmeal and 1/4 cup flour. In the 1997 version, the recipe contains 6 tablespoons cornmeal to 1/2 cup flour (actually, they have doubled that to make a "fatter" bread). Spoonbread (particularly soufflé type) is often served with special meals and holiday meals, but any type makes a great breakfast food, drizzled with a bit of maple syrup. It's also delicious with spicy beans and stews, or with cooked greens. NOTE ABOUT EGG REPLACERS: In these recipes, I used powdered commercial egg replacers because they are easily available and can be used by most people. However, if you happen to have a copy of either of the delightful books by Crescent Dragonwagon, The Cornbread Gospels or Bean by Bean: a Cookbook (on p. 255), you can use her inventive homemade egg sub that she calls "Eggscellence" (on pps. 352-353). (You can see the recipe here, too.) I am planning to play with using the new vegan egg yolk sub, The Vegg (UPDATE: The Vegg is not available in Canada at this time) and also Aquafaba, in future as well. Preheat oven to 400°F. Grease a 2-quart round or oval casserole and line the bottom with baking parchment cut to fit. With an immersion blender or an electric mixer/beater, beat the milk with the egg replacer powder and nutritional yeast until very foamy. In a large bowl, whisk together the biscuit mix and cornmeal. Add the frothy milk mixture and the can of cream-style corn. Mix briefly (like a muffin batter). Scoop into prepared pan and smooth the top evenly. Carefully pour the melted vegan buttery spread over the whole top surface. Bake, uncovered, for 25 minutes. Serve hot, plain, or with savory items such as stew or chili, or with maple syrup. Nutrition (per serving): 301.4 calories; 32% calories from fat; 11.3g total fat; 0.0mg cholesterol; 427.2mg sodium; 337.3mg potassium; 46.0g carbohydrates; 2.4g fiber; 2.9g sugar; 43.6g net carbs; 6.5g protein; 6.5 points. This is a white flour mix-- I'm going to try it with half white whole wheat pastry flour next time. 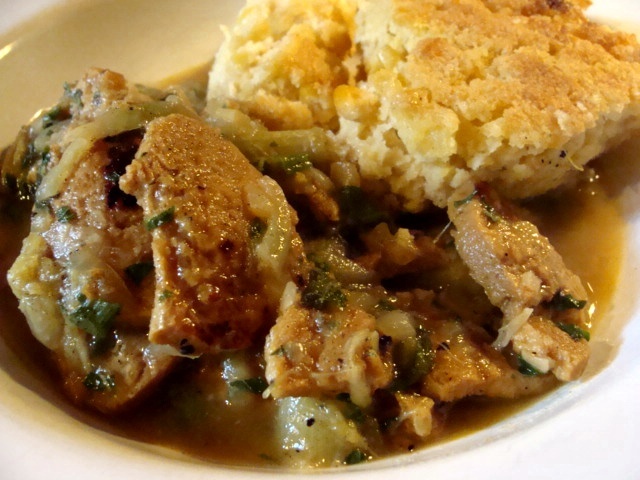 There's another biscuit mix in my book World Vegan Feast, but this one seems to work better in a spoonbread. In a large bowl, whisk together the flour, baking powder, sugar and salt. Drizzle in the oil and mix with your hands until it looks crumbly. Store airtight in a cool place. Nutrition (per cup): 574.5 calories; 26% calories from fat; 17.5g total fat; 0.0mg cholesterol; 759.7mg sodium; 726.7mg potassium; 92.4g carbohydrates; 3.2g fiber; 4.1g sugar; 89.3g net carbs; 11.6g protein; 12.3 points. If you want to use this in a recipe that calls for buttermilk, use soy, nut or hemp milk curdled with a little lemon juice, and add 1/4 teaspoon baking soda per cup of "buttermilk" used. Add it to the dry ingredients. 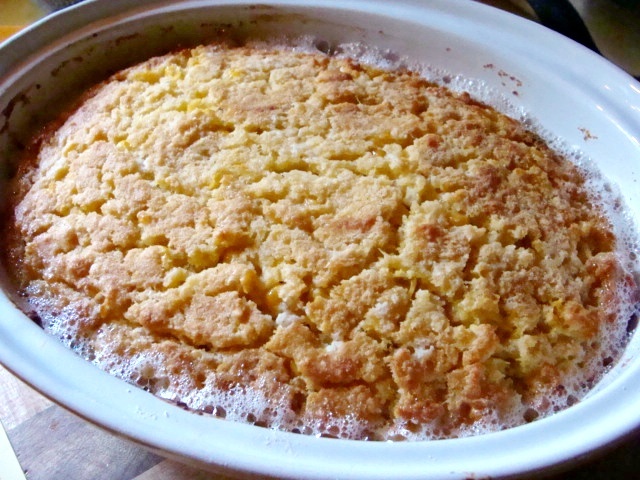 This old-fashioned treat, which I consider real "comfort food", is also called "Crusty Soft-Center SpoonBread" and was known as "spider bread" in pioneer days, because it was made before an open fire in a cast iron skillet with "legs" called a "spider". This cornbread starts out very liquid-y, and ends up with a "custard" layer on the bottom. It's delicious with maple syrup. I didn't think I could make it work without eggs, but it does! The recipe can be doubled and made in a 9" square pan or 10" cast iron skillet. NOTE: I made this the first time in an 8-inch cast iron skillet, but I preferred it made in an 8-inch soufflé dish (straight-sided casserole) about 3 inches deep. The top was well-browned but more tender and it was a bit thicker. Preheat the oven to 400ºF. Place the oil in an 8-inch round, straight-sided casserole or soufflé dish (about 3 inches deep). Place in the oven while it heats up. Mix the Dry Mix ingredients together in a medium bowl. Add the Wet Mix ingredients and blend well. Stir into the Dry Mix just until mixed. Scrape into the hot pan with the oil. Swirl the 1/2 cup milk over the batter-DON'T STIR IN! Bake for 35 minutes. Cut into 4 to 6 wedges and scoop out carefully. Turn each piece upside-down on a small plate, scraping out any residual "custard" left in the pan and spreading it over the top of the bread. Serve hot with maple syrup or with spicy beans or stews, or vegetables (you'll need a fork to eat this). It's very versatile as a side dish! You can see the custard layer on the bottom in this picture. You may prefer to serve it flipped over, with the custard layer on top-- it's up to you. Nutrition (per serving): 180.1 calories; 26% calories from fat; 5.5g total fat; 0.0mg cholesterol; 447.3mg sodium; 117.5mg potassium; 29.7g carbohydrates; 2.4g fiber; 4.6g sugar; 27.3g net carbs; 4.6g protein; 3.6 points. Nutrition Facts Nutrition (per serving): 120.1 calories; 26% calories from fat; 3.7g total fat; 0.0mg cholesterol; 376.5mg sodium; 78.3mg potassium; 19.8g carbohydrates; 1.6g fiber; 3.1g sugar; 18.2g net carbs; 3.1g protein; 2.4 points. The stew is pictured here with a vegan corn "spoonbread" because I was testing that recipe the same day and wanted to use it up. It should be served with rice-- though it was delicious with the "spoonbread", which I will blog about in a few days. UPDATE: Spoonbread recipes here. I've been meaning to "veganize" this type of stew for a long time, but finally having our own rhubarb plant and cutting the first stalks got me fired up to go for it. In addition, I'm on the look-out for savory rhubarb recipes, to avoid all that sugar that's in most rhubarb recipes. So far, I've only found this type of Persian stew using rhubarb-- if you know of any other Persian recipes using rhubarb, please share. I have found some Arabic sherbet recipes using rhubarb, and those shouldn't be too sweet. This recipe is a simple version of what can be a complicated dish. It sounds odd, but the rhubarb lends a fresh, almost lemony flavor and also thickens the stew, and the mint, though plentiful, does not overwhelm, but complements the other flavors. We were very taken with this dish, so I hope you'll give it a try while rhubarb is abundant. Because the soy protein or seitan is so low in calories and fat, you can get away with adding some olive oil and vegan buttery spread for richness and still have a very low-calorie meal. NOTE: To reconstitute textured soy/vegetable protein chunks, simmer them for about 15 minutes in a tasty (rather strong) vegan broth, using about 2 cups broth per 1 cup chunks. Drain well. Note: Make sure that your textured soy protein or seitan chunks are well drained. Heat the olive oil in a large nonstick, cast iron or hard-anodized aluminum skillet, stir-fry pan or sauté pan over high heat. As soon as the oil is hot, swirl the pan to coat the bottom and add the drained soy protein or seitan chunks. Turn the heat to medium-high and stir-fry until the chunks have browned a bit. Remove them to a plate. Add the onions to the same pan and steam-fry until softened. (To steam-fry, stir-cook over high to medium-high heat, adding a squirt of water as needed to keep the onions from sticking.) An alternative method is to place the onions in a microwave-safe casserole or pie plate sprayed with oil from a pump-sprayer and sprinkle with salt. Cover and microwave at full power for about 10 minutes. Set aside. Melt 1 tablespoon of the vegan buttery spread in a medium nonstick, cast iron or hard-anodized aluminum skillet, stir-fry pan or sauté pan over medium-high heat. Add the chopped mint and green onions and stir-fry for about 5 minutes, or until they have softened. Clean out the pan. Combine the broth, browned soy protein or seitan chunks, softened onions and sautéed mint and green onion in a heavy pot. Add the coriander and turmeric. Bring to a boil, then turn down to a high simmer and cook, uncovered, for about 30 minutes, checking often to make sure it doesn’t stick. While the stew simmers, melt the 2nd tablespoon of buttery spread over medium-high heat in the same pan that you used for the mint. Add the rhubarb and sauté for a few minutes, just until it softens, but don’t let it get mushy. After 30 minutes, the broth will have cooked down somewhat. Stir the rhubarb into the stew, along with the agave nectar and freshly-ground pepper to taste. Serve the stew with steamed basmati rice. Nutrition (per serving): 259.4 calories; 29% calories from fat; 9.0g total fat; 0.0mg cholesterol; 744.8mg sodium; 1247.8mg potassium; 30.7g carbohydrates; 5.8g fiber; 8.7g sugar; 24.9g net carbs; 23.6g protein; 5.1 points.